In Moberg CL. René Dubos, Friend of the Good Earth: Microbiologist, Medical Scientist, Environmentalist. Washington, D.C.: ASM Press; 2005. 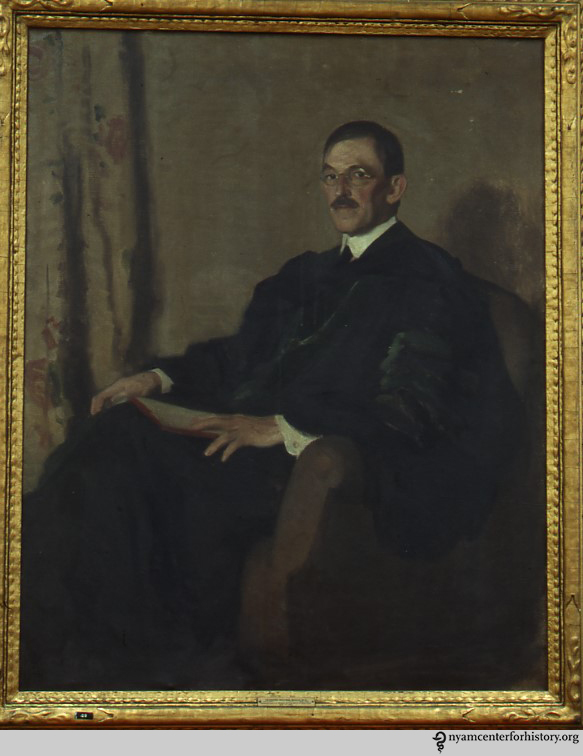 Oil portrait of Hermann M. Biggs by Renwick, held in our Oil Portrait Collection. Dubos pointed out in his lecture that when Robert Koch discovered the Tubercle bacillus in 1882, it revolutionized the perception of TB. It was no longer a social disease but a biological one. The bacteriological era had begun! 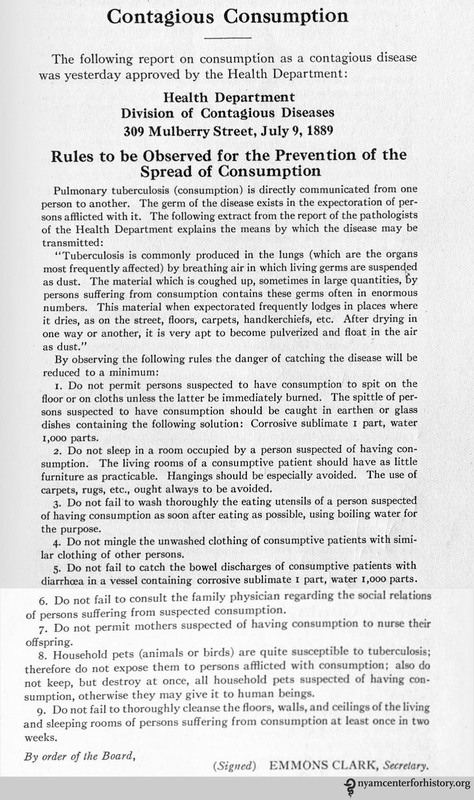 The Health Department leaflet, reprinted in Knopf SA. A History of the National Tuberculosis Association: The Anti-Tuberculosis Movement in the United States. New York: National Tuberculosis Association; 1922. Over the years, public-health measures helped reduce the spread of TB. Despite these efforts, the population was still susceptible to infection. Mortality rates had been falling faster than infection rates, which Dubos noted in The White Plague. 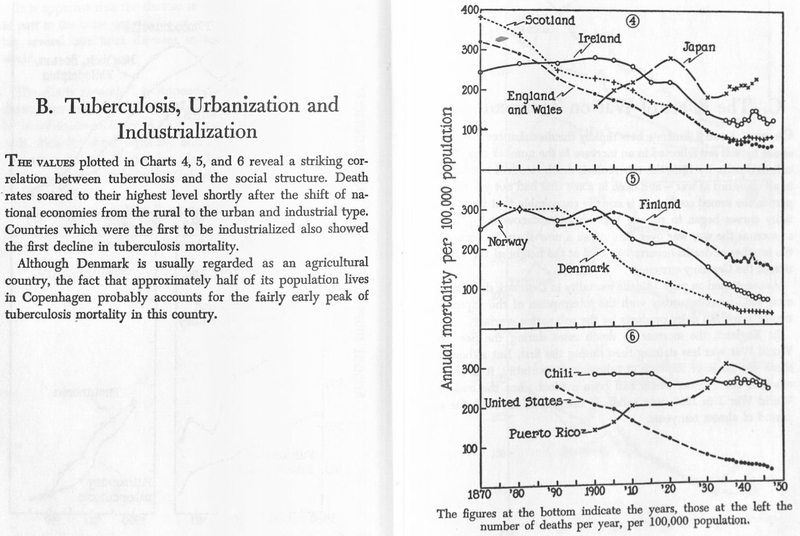 He also showed a connection between industrialization and reduced mortality. In Dubos, RJ, Dubos J. The white plague: Tuberculosis, man, and society. New Brunswick : Rutgers University Press; 1987. Complete eradication of the disease was almost impossible. Instead, Dubos suggested two ways to attack the progression of the disease: 1) decreasing risk of infection and 2) boosting resistance. To do this, thought Dubos, researchers must focus on fostering new and unorthodox ways to determine resistance to infection and adventure into unexplored fields. Dubos stressed in his lecture that it was imperative to investigate the human and environmental factors that determine resistance to infection. But according to the Global Tuberculosis Report 2014, “tuberculosis (TB) remains one of the world’s deadliest communicable diseases. In 2013, an estimated 9.0 million people developed TB and 1.5 million died from the disease.” Today, efforts to prevent and control TB infection are similar to those championed by Biggs and Dubos: drug-resistant surveillance, community-based TB activities, and collaboration across sectors in research and policy-making. 1. Hirsch JG, Moberg CL. 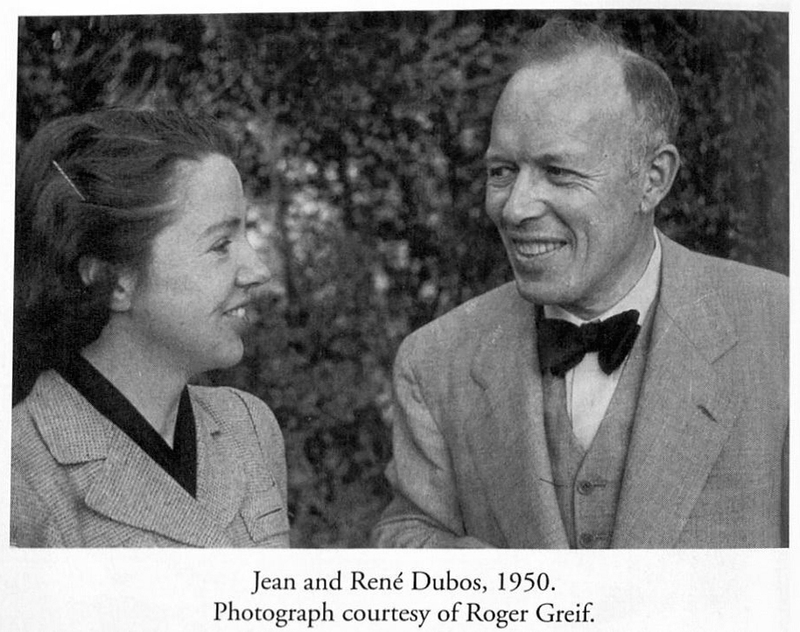 Rene Jules Dubos 1901-1982. Washington, D.C.: National Academy of Sciences; 1989. Available at: http://www.nasonline.org/publications/biographical-memoirs/memoir-pdfs/dubos-rene.pdf. Accessed March 20, 2015. 2. Dubos RJ, WNYC (Radio station : New York NY). Biological and Social Aspects of Tuberculosis. New York : WNYC; 1951. http://www.wnyc.org/story/biological-and-social-aspects-of-tuberculosis-26th-hermann-m-biggs-memorial-lecture. 3. Knopf SA. A History of the National Tuberculosis Association: The Anti-Tuberculosis Movement in the United States. New York: National Tuberculosis Association; 1922. 4. Knopf SA. A History of the National Tuberculosis Association: The Anti-Tuberculosis Movement in the United States. New York: National Tuberculosis Association; 1922. This entry was posted in Collections, History of medicine and tagged Biological and Social Aspects of Tuberculosis, Hermann M. Biggs, NYPR, public health campaign, radio, René Jules Dubos, TB, tuberculosis, WNYC, World Tuberculosis Day by nyamhistorymed. Bookmark the permalink.